I was scheduled for an induction on Friday, February 24th at 38w4d pregnant. I’m not sure when these girls would have decided to show up had I not been induced. They were pretty cozy, I guess. We checked in at 6am. I got changed and they started my IV. My parents and Taylor arrived around 7:30am. Because the floor wasn't busy, they went ahead and assigned us a postpartum room which is where they were able to hang out all day. It worked out so well! Dr. Charles had ordered a growth scan to check the babies one last time and to see how much they were estimated to weigh. The measurements showed Addyson to be 7lbs4oz and Kynley 6lbs5oz. 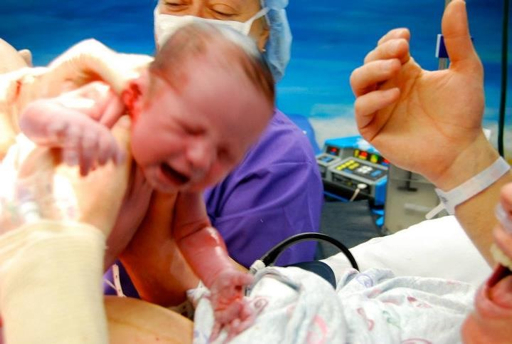 Debbie, our doula, arrived shortly after this. Dr. Charles came and checked me and I was still 5cm dilated and about 60% effaced, just like at my appointment 2 days prior. She stripped my membranes to give things a jump start and then started the pitocin just before 10am. 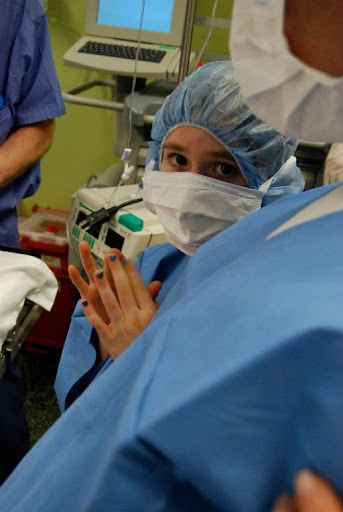 She also let us know that she had gotten permission for Taylor to be in the Operating Room with us for Addyson’s birth. 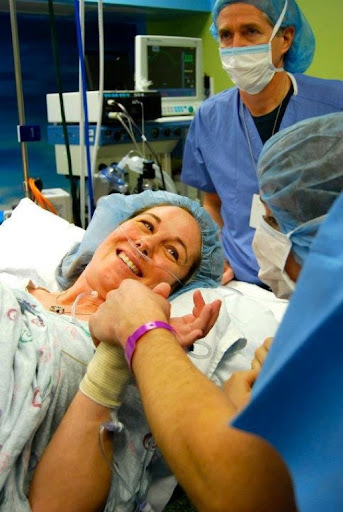 I was delivering in the OR because at 32 weeks Kynley decided to flip breech on us. From the beginning of the pregnancy Taylor expressed a desire to be there when the girls were born and once Kynley flipped, we didn’t think it would be possible. I’m so thankful for an awesome Doctor, and an awesome hospital who made this happen. We took some laps around the floor and every few we would stop by the postpartum room and say hello to Taylor and my parents. Taylor wasn't quite sure what to think during the contractions but she was enjoying hanging out with Gramps & Gamma... watching tv and eating all kinds of snacks. We eventually had to settle in the labor room because the nurse said they needed to monitor the babies more closely because of the pitocin. It became clear I wasn’t going to be able to move about freely or get in the tub which I was really bummed about. I refused to be bound to the bed so we adapted. Debbie was awesome at suggesting different positions to be in. I remember asking the nurse when we would transfer to the OR. She said once I started pushing they would wheel me down there in the bed. I asked why I couldn’t walk into the OR. She answered, “You will definitely not be allowed to walk. The baby could fall out onto the floor.” Ummmmm, ok.
By about 2:45 my contractions were 2-3 minutes apart. Dr. Charles checked me again and I was 6-7cm and about 70% effaced. I won’t lie. I was really upset to hear this. Starting out at 5cm, I expected to hear a much larger number. At Debbie's suggestion, I decided to labor in the rocking chair a while. I remember starting to cry. I didn’t voice it but I was so mad at myself. I was mad I had agreed to the induction and was worried my babies just weren’t ready to come out. Brandon and Debbie never asked any questions - just hugged me and got me tissues. They were so wonderful - although I’m sure they were thinking I was nuts. Dr. Charles came back and checked me around 3:30. I was 7cm but more effaced. Again, I was disappointed. She wanted to break my water because she was thinking that would move things along pretty quickly but she had another patient in the room next door who was almost completely dilated. 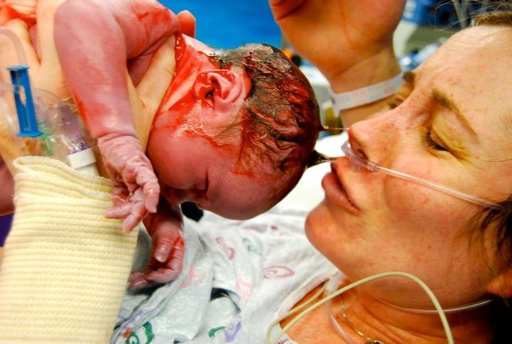 She wanted to deliver her first so she wouldn’t be faced with both deliveries at the same time. The lady next door finally delivered and my water was broken at 4:15. Things changed immediately, with the next contraction. It was much more intense and I could feel Addyson moving down. It wasn't too long before I felt my body start to push. Dr. Charles checked me around 5:00 and I was 8-9cm. They started to finalize the preparations in the Operating Room. My body started pushing more with the next contraction. I was standing up, facing Brandon, with my arms around his neck. When a contraction would come, I would squat and Brandon would hold me up. I think we were like this for 2 contractions and I could feel her start to crown. It was time to go! 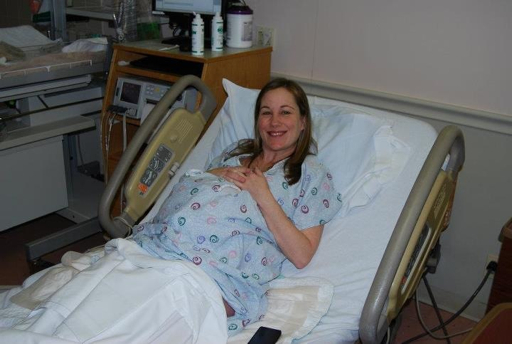 Susan, our awesome midwife, was with us in our room at the time. She unhooked the monitors and walked me down the hall to the OR. And no, the baby didn't fall out on the way. The first thing I noticed when we walked in was how inviting it was. Seems strange for an OR, right? The walls were painted blue and white like clouds and the word “breathe” was painted on the ceiling above the bed. The second thing I noticed was how many people were in there. The room was packed! They wanted me to lay down on the table which seemed impossible. There was an anesthesiologist standing behind the bed and he helped me get situated. I remember him sliding pillows under my back as I laid down which was so nice. He was there just in case there was a problem with Kynley and they needed to do a c-section. 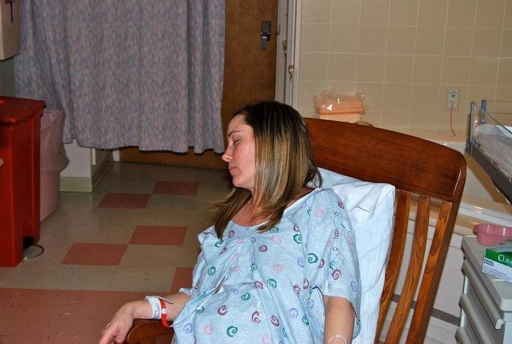 Because I had opted to not have an epidural, they would have needed to put me under. Here I am asking Taylor if she's ready to meet Addyson. I started pushing with the contractions and within just a few, Addyson was born at 5:29pm! She was so perfect. What a surreal moment. After a very long 5 years of wishing, hoping, praying, dreaming - one of my precious baby girls was here. All I wanted to do was hold her. You can see my hands reaching for her in the pictures. Unfortunately, I wouldn’t get to hold her until after her sister was born. 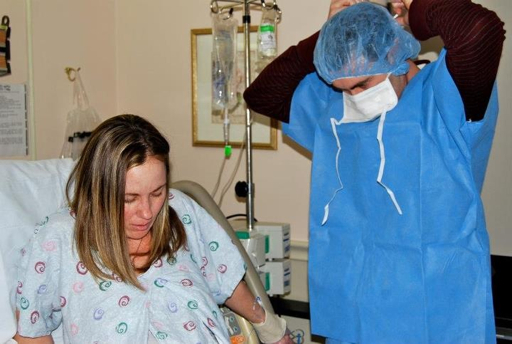 Taylor was able to go with Addyson and cut her cord. She is still talking about how awesome it was to be there when one of her sisters was born. Once Addyson was born, everyone was focused on Kynley. The plan was for Dr. Charles to do a breech extraction. With Susan operating the u/s machine, she would locate the position of Kynley's feet and reach into my uterus to grab them. She would then pull them down, deliver her body halfway, break her water and then let me deliver her head with contractions. We had had many conversations about this during the last several weeks of my pregnancy. We had a plan. However, Kynley had her own plans. Dr. Charles was having a hard time getting a hold of both of Kynley’s feet. She tried. And tried. And tried some more. She could get one but couldn’t get a hold of the other. 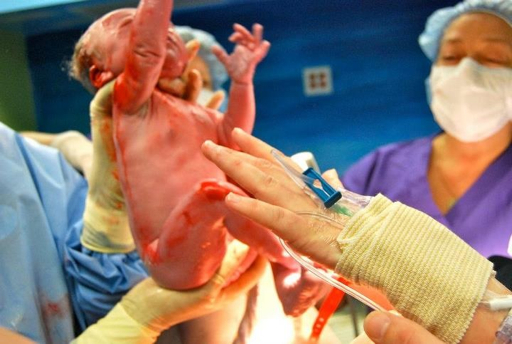 She had asked the anesthisiologist to give me something to relax my uterus because when I would have a contraction, it would tighten around her hand. He had to give me quite a bit of this medicine because my uterus just wouldn’t stop. After about 15 minutes, Kynley’s water broke which was not part of the plan either. When that happened, a body part came out and after some deliberation, it was determined it was a knee. Since the baby couldn’t safely be delivered that way, Dr. Charles pushed it back in. After more than 20 minutes of trying to find both of her feet, Dr. Charles looked at me and said it was time to do a c-section. At this point, I was almost begging that nice anesthesiologist to knock me out. I knew this part of the delivery would not be fun - especially with no pain medicine. But I was definitely not prepared for how long it would take. I had thought it might be 5-10 minutes before I was delivering her head - not more than 20. I tried so hard to stay focused but it didn’t feel like I was very successful. 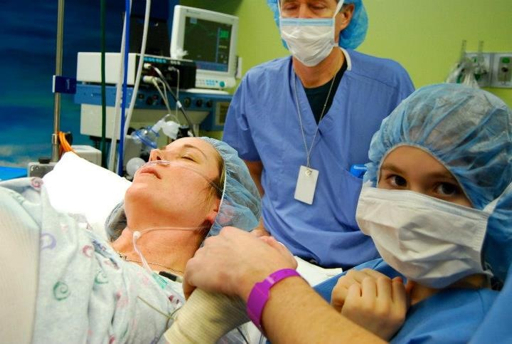 I remember saying, more than once, to all of the people in the OR, “I’m sorry I’m so loud.” The pain was really unlike anything I had experienced before. Amazingly enough, Kynley’s heartrate never dropped below 140. She was never in any sort of distress. Dr. Charles decided to give it one last shot. Both of her hands were inside my uterus searching for Kynley’s feet. During this last search, she found her bottom. She looked at me and told me her bottom was presenting and we could do this. She asked me to start pushing but now I wasn’t feeling any contractions because of the drug I was given to relax my uterus. So she had them turn the pitocin back up and within a few minutes I was feeling contractions again. It wasn't long before her bottom emerged. Her feet followed shortly after. Dr. Charles helped both of her shoulders out and at 6:02pm we finally got to see her sweet face! The relief was indescribable. 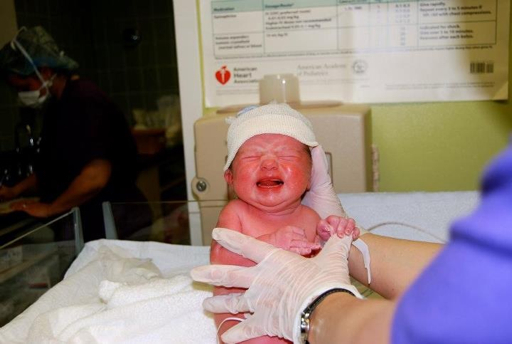 She was here, safe and sound, and I did not have to have a c-section. She came out screaming and they put her right on my chest. Love at first sight, absolutely. I delivered the placentas (which had fused together) shortly after. I love this man - even in this goofy hair net. He was my rock and I couldn't have done it without him. Dr. Charles assessed the damage and much to my surprise, I had a very minimal first degree tear which she said was only because of how aggressive she had to be trying to grab those legs - not because of the deliveries. 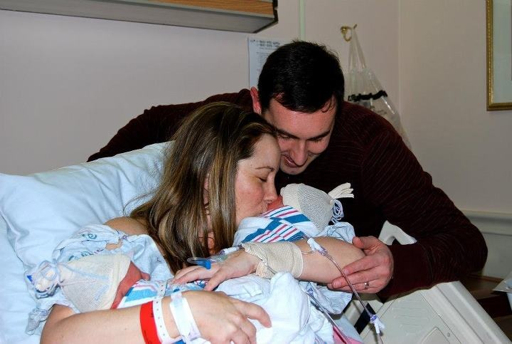 Addyson weighed 6 pounds and was 18.9 inches long. Kynley weighed 5 pounds 6 ounces and was 18.3 inches long. 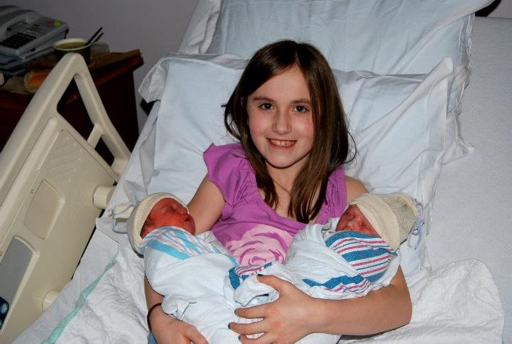 Addyson's apgars were 9 and 10; Kynley's were 8 and 9. 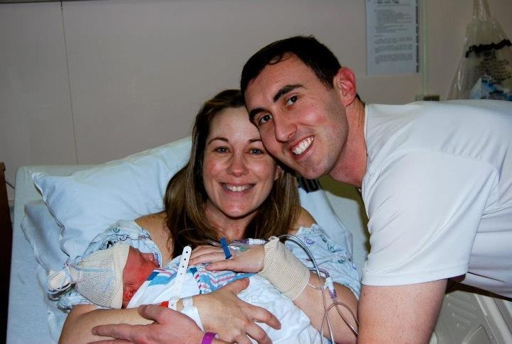 Neither baby needed any NICU time. After we were done in the OR, we headed back to the labor room where we had spent most of the day. Here we were reunited with Addyson! Taylor is an amazing big sister. Not that we're surprised. 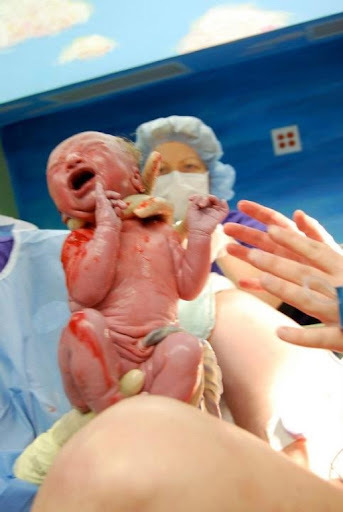 I owe a huge thank you to Debbie for taking pictures during our birth. I was amazed when I saw them. She was so attentive to me during the whole process that I don't know how on earth she got these awesome shots. But I'm so glad she did. I found this picture on my phone and I wanted to include it because it's just so me. It was taken a few hours after the girls were born. My sweet parents knew exactly what I would want after such an exciting day - an iced venti chai from Starbucks! 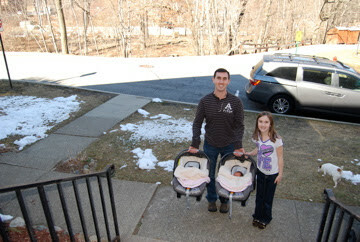 Less than 48 hours after the girls were born, we headed home. So that's our story. It's been a long journey and we couldn't be more blessed. With tears in my eyes, I congratulate you all again. Thank you for taking me on your amazing journey. It was an honor! Unbelievable, April! I cannot believe you delivered them both vaginally, much less naturally! Will you come to Nashville in 6 weeks and coach me?! I have a doula and an awesome doctor, but with my first I got an epidural right after my water was broken, so I'm very nervous about my ability to cope with the pain and other discomforts of labor. Your story is VERY encouraging! Thank you for sharing! 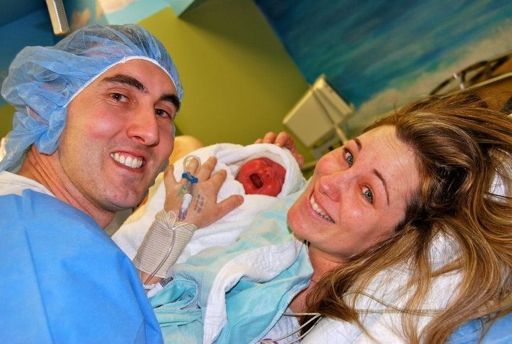 What an amazing birth story! Your girls are beautiful and I loved following your journey! Congratulations!